Andrew Gwynne MP has backed an emergency rescue plan for British solar being put forward as a solution to the current crisis surrounding proposed 87% cuts to the Feed-in Tariff for solar. 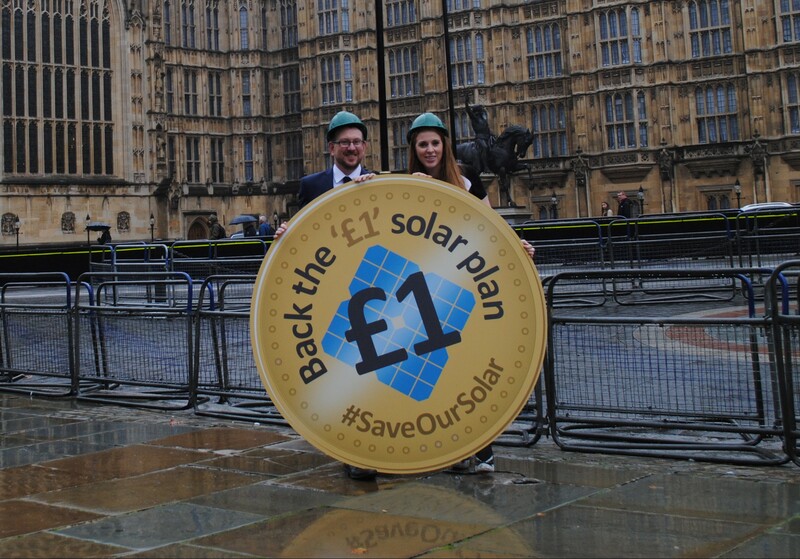 The MP met solar industry representatives during a solar action day outside the House of Commons to promote the £1 plan, as a growing number of voices are calling on the Government to reconsider its plans. The Solar Trade Association’s ‘£1 solar rescue plan’ proposal has been designed to work for both the Government and solar businesses, allowing the industry to survive while giving the Government the cost control guarantees it needs. The proposal involves slightly higher tariffs, higher and more flexible caps on the total amount of solar that can be deployed and an improved mechanism to continually bring support levels down. The plan would only add an extra £1.06 on average household energy bills by 2019, demonstrating how affordable it would be to adopt steady reductions in support for solar power. Three solar businesses, Mark Group, Climate Energy and Southern Solar, have already gone into administration over the last few weeks, citing government cuts as the cause and making over 1,200 people across the country redundant.